What a fabulous cookie! 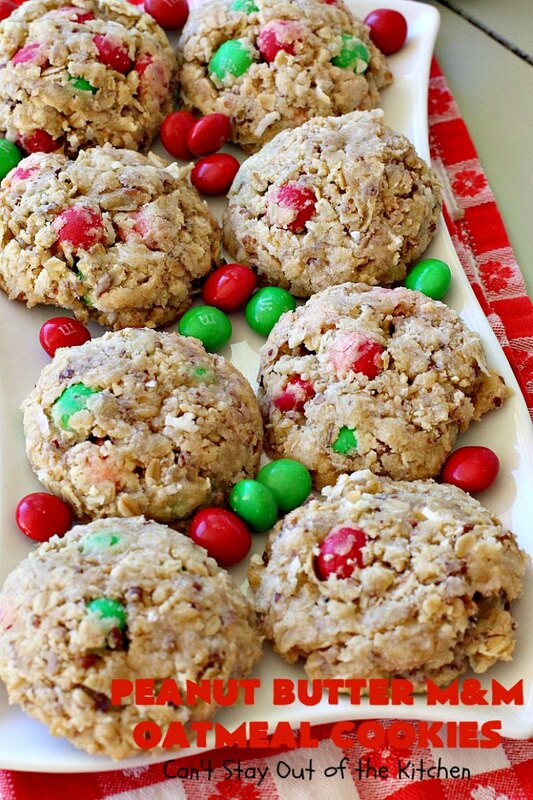 Peanut Butter M&M Oatmeal Cookies. Whoa! Yes, yes, yes. 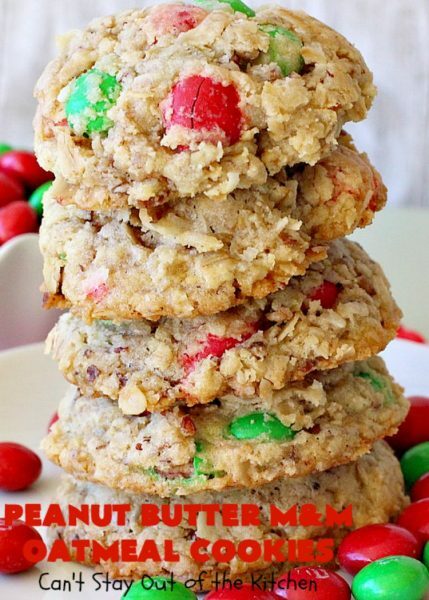 🙂 These amazing Oatmeal Cookies include coconut, finely diced pecans and Peanut Butter flavor M&Ms. They are absolutely awesome and a step-up from regular Oatmeal Cookies. In fact, they are so good you may want to put them on your regular baking list. I started with my delicious Coconut Date Cookies recipe, but changed things up a bit. Instead of using dates, I used Peanut Butter M&Ms. The flavor, texture and taste were all fantastic. These cookies are terrific snacks for soccer practice or ball games, potlucks, tailgating or office parties. I sent these out to John’s office along with several trays of other cookies back in January. I got rave reviews from these spectacular cookies. If you enjoy a little bit of peanut butter, chocolate, coconut, oatmeal and pecans, this cookie is for you! It simply bursts with flavor. I loved the crunchy texture. 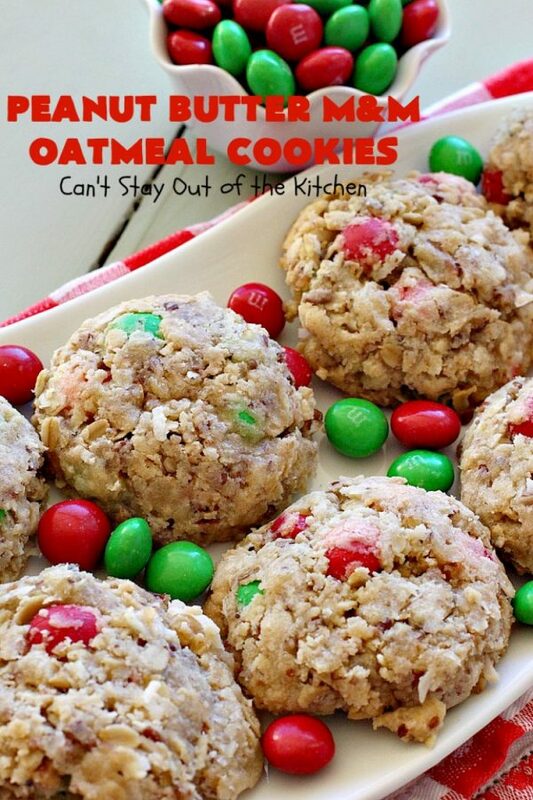 You just can’t go wrong with Oatmeal Cookies of some kind. 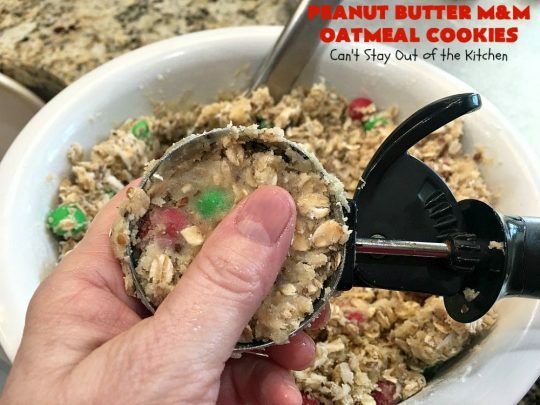 It’s certainly a favorite way to make Oatmeal Cookies. 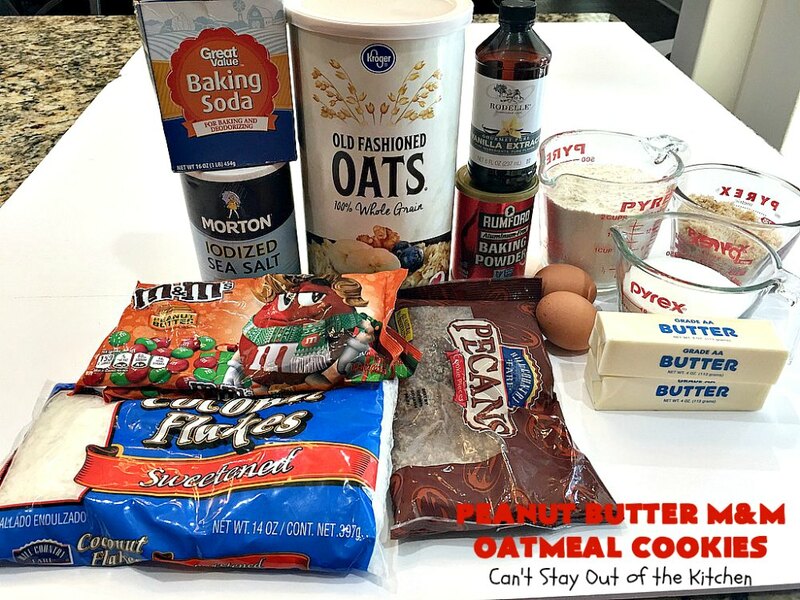 My mom used to make her Oatmeal Cookies with coconut and oatmeal. Those were some of my favorite cookies growing up. 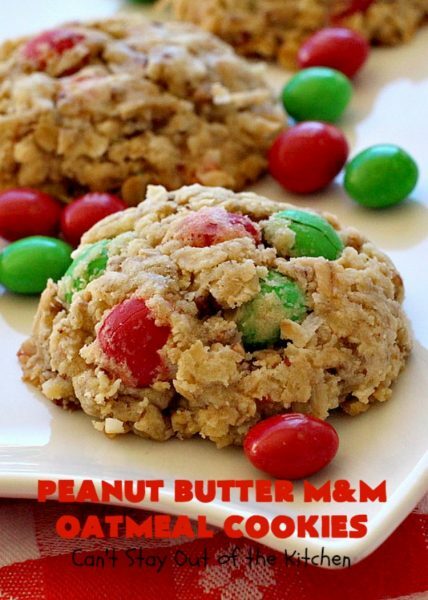 These cookies, with the addition of the Peanut Butter M&Ms and pecans bump up the flavor tremendously. 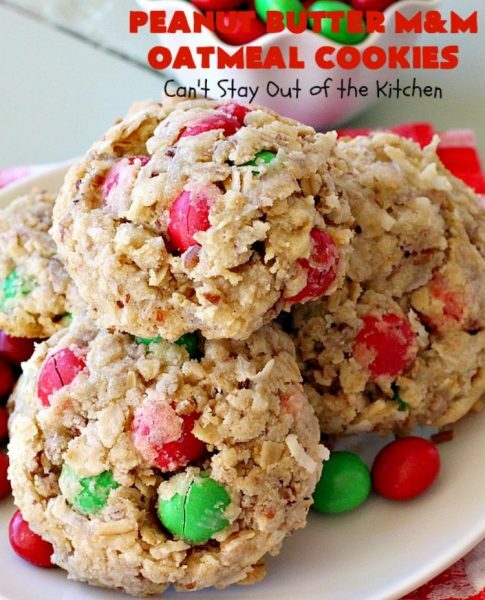 They also increase the deliciousness of regular Oatmeal Cookies. Yes, they are so, so satisfying if you want a sweet treat in your house. Give Peanut Butter M&M Oatmeal Cookies a try. You and your family will absolutely devour them. 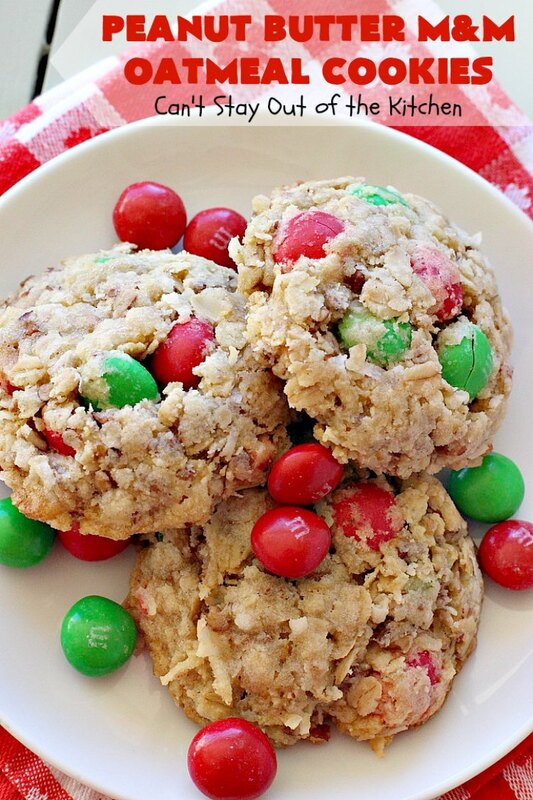 Peanut Butter M&M Oatmeal Cookies are sensational! These are terrific cookies for tailgating parties. 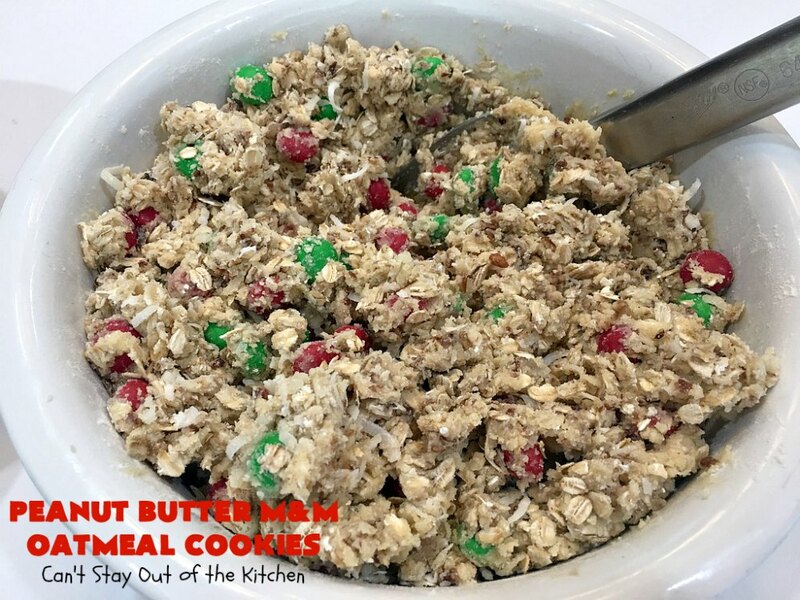 If you enjoy Oatmeal Cookies, this amped up version will have your motor going! Peanut Butter M&M Oatmeal Cookies are nice and plump. They are soooo delicious. I used these ingredients. While I used pecan chips because that’s what I had on hand, coarsely chopped pecans will work too. Soften butter. Add granulated sugar, brown sugar, vanilla, eggs, baking soda, baking powder and salt. Add UNBLEACHED all-purpose flour. Bleached flour toughens baked goods. 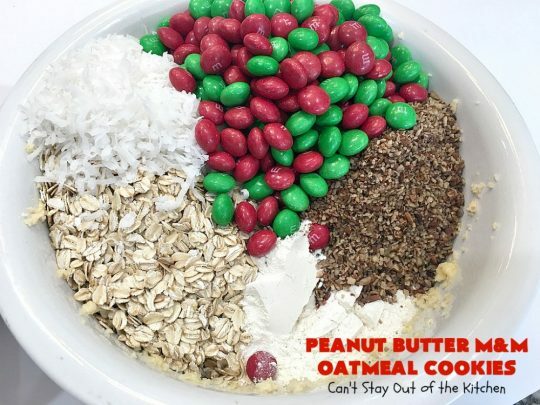 Add oatmeal, coconut, pecans and Peanut Butter flavored M&Ms. Stir with a heavy spoon to combine. Scoop dough with a one-quarter cup scoop. Press dough firmly into scoop. Place dough on greased cookie sheets several inches apart. Bake at 350 about 17-22 minutes or until done. (My cookies took about 25 minutes while rotating racks every 8 minutes). Peanut Butter M&M Oatmeal Cookies are great snacks to take for soccer practice, baseball games or parties. These cookies got rave reviews when I sent them out to my husband’s workplace. 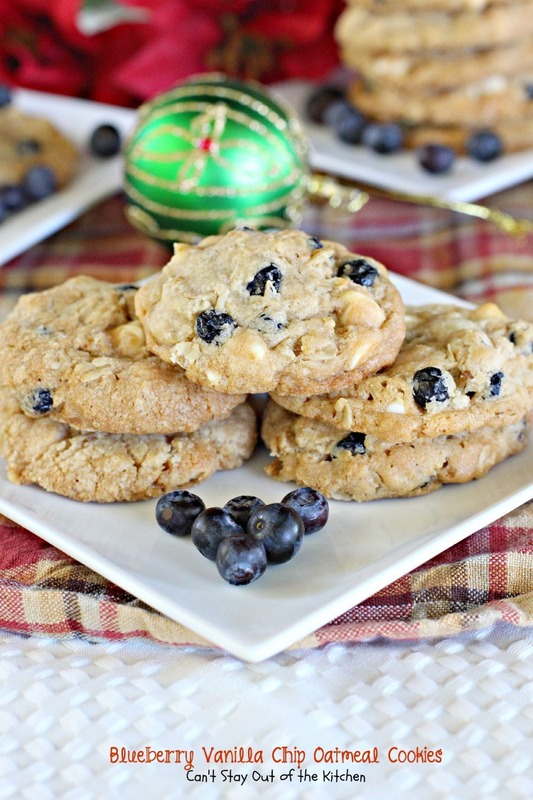 Amp up your Oatmeal Cookies! Make a batch of these Peanut Butter M&M Oatmeal Cookies the next time you bake for your family. These Oatmeal Cookies are some of the best you'll ever eat. This amped up version includes coconut, pecans and Peanut Butter Flavored M&Ms. They are absolutely sensational. They're also terrific for tailgating or office parties, potlucks, soccer practice or baseball games when you're waiting on kids! 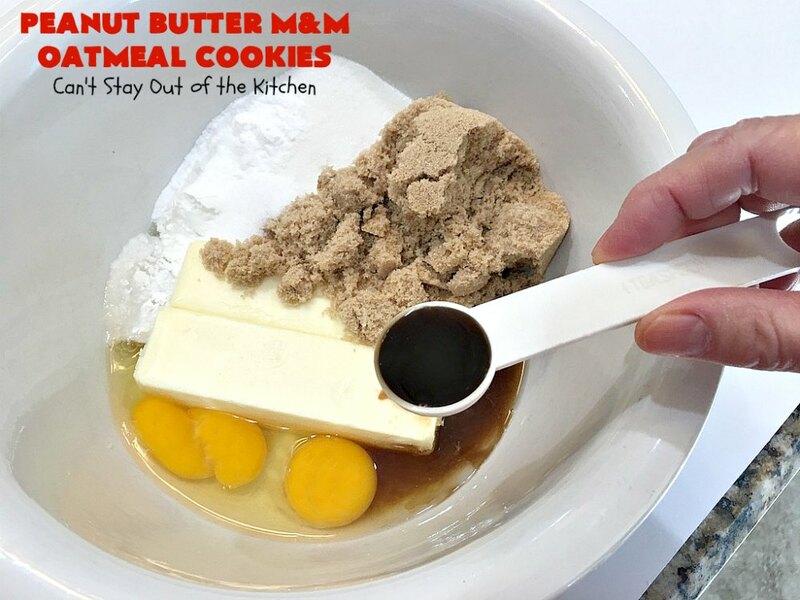 In a large mixing bowl, mix together the butter, brown sugar, white sugar, eggs, vanilla, baking powder, baking soda and salt. Blend well with an electric mixer until smooth. Stir in flour, coconut, peanut butter M&Ms, oatmeal and pecans until thoroughly mixed. 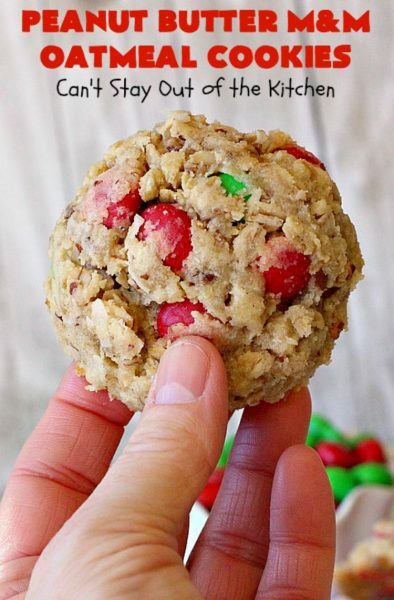 Press cookie dough into a ¼ cup scoop. 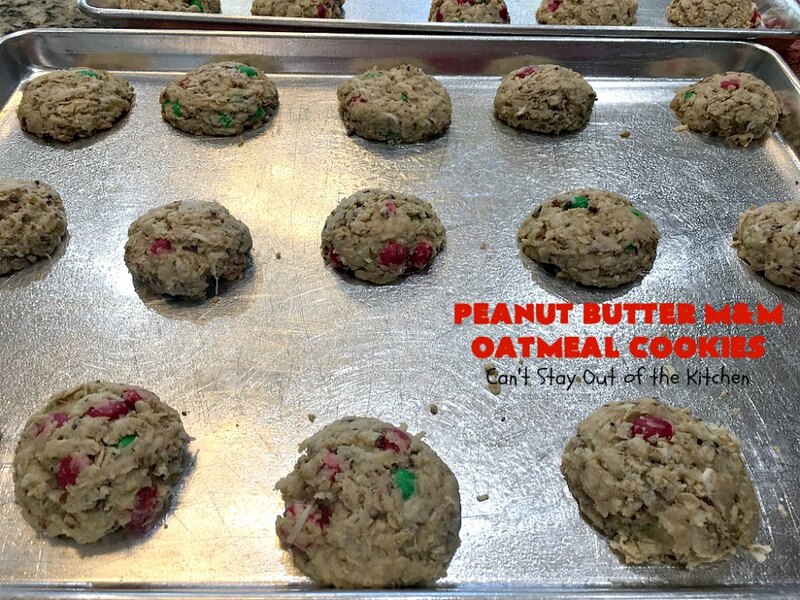 Press firmly or the dough will crumble when you drop the scoopfuls of cookie dough onto a cookie sheet. Space cookies 3 inches apart on greased baking sheets. Bake for 17 to 22 minutes or until lightly browned and just set. Rotate racks half way through baking time. NOTE: The secret to making these cookies is to not overbake them. If you overbake they become too crispy. 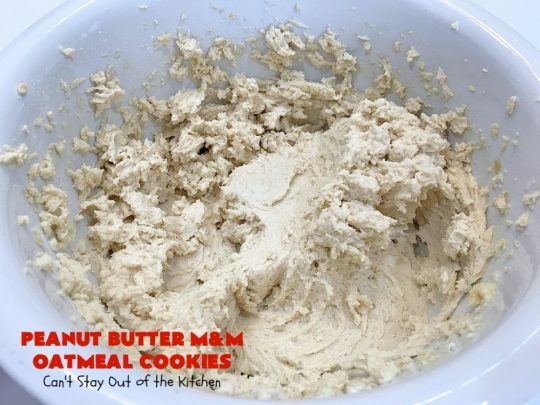 If you bake them just until the liquid texture on top of the cookie is almost baked, the cookies will be chewy and delicious. NOTE: My cookies took 25 minutes to bake, rotating racks about every 8 minutes. I had three racks baking at one time so it may have taken a little longer than if only baking on two racks. NOTE: These cookies spread quite a bit while baking. Make sure you space them about three inches apart or they will run into each other while baking. NOTE: I used pecan chips which are very finely chopped pecans – almost like almond meal. 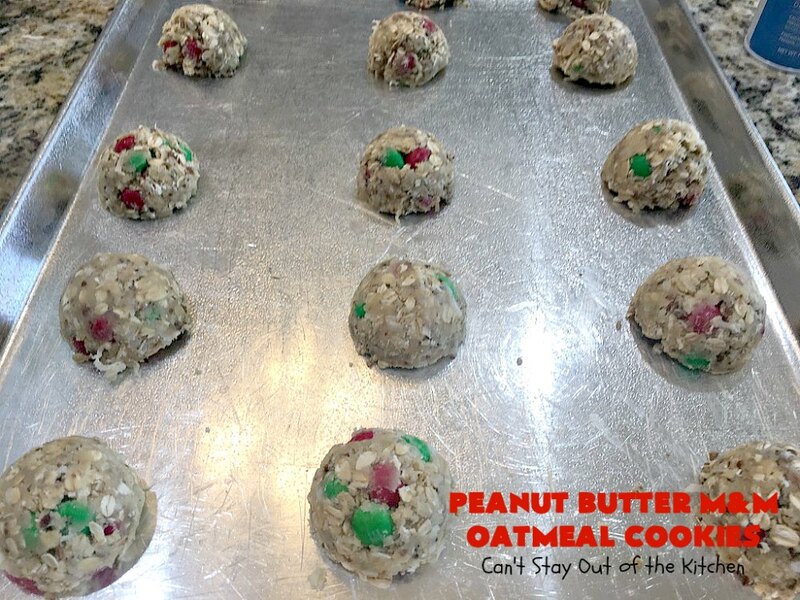 They will absorb into the cookie dough differently than coarsely chopped pecans. If you cannot find pecan chips, you may have to chill the dough on the cookie sheets about 30 minutes before baking. Otherwise, the cookies may run into each other. If you enjoy Oatmeal Cookies, these are so mouthwatering. 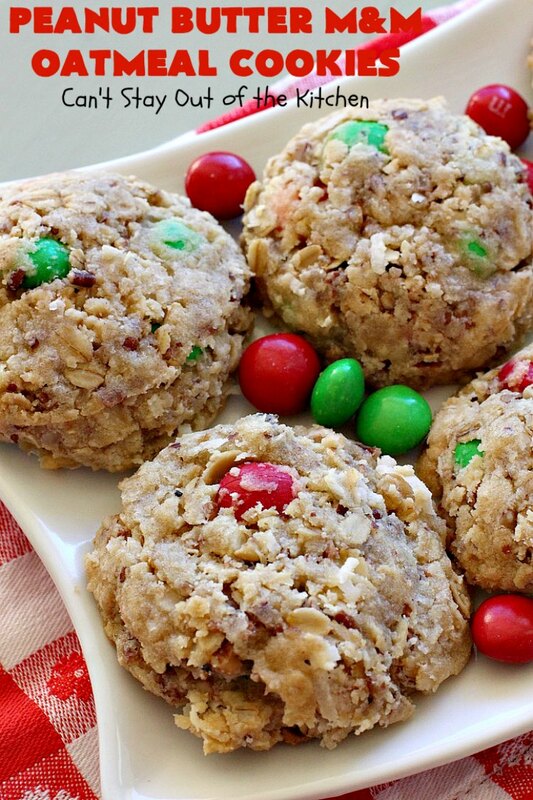 The Peanut Butter M&Ms really dress up the flavor of Oatmeal Cookies. These cookies are also great for holiday baking and Christmas Cookie Exchanges.